Every nail used in construction has its own application and knowing how to select the right one can save you money. Nails are designed especially for materials and their intended use and choosing the right one might be the difference between a successful project or some claim in the future. Today nails are manufactured from stainless steel or steel, developed into a variety of sizes, styles ​, and dimensions. Wood, metal, masonry, and gypsum all use different kinds of nails. One critical item that must be defined prior to choosing the type of nail being used is the thickness of the materials going to be nailed. Another important aspect you might want to consider is the type of use either permanent or temporary or considers if the nail is going to be installed on the exterior or it will be an interior nail. If it’s temporary some of you might think to use a screw instead of a nail, that being one of the multiple possibilities to choose from. Common nails are usually classified according to their length. Common nails are weighed and sold in pounds and usually manufactured in lengths of 1 inch to 6 inches. The longer the nail, the wider it gets. A nail longer than 6 inches, is called a spike. Smaller head nails are great for finishing jobs because they can be fully driven into the surface and painted over. 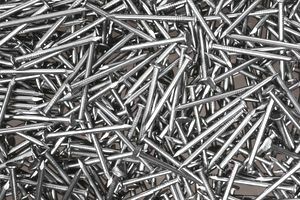 Common nails are used for construction and rough fastening jobs. Adhesive coated nails while driven can release heat from friction releasing the adhesive. Later the adhesive released from the nail friction cools, forming and hardened surface and bonds to the wood. A non-coated nail is referred to as bright. What Type of Nails are Recommended for Roofing? Scaffolding nails are double-headed, one stacked on top of the other about ¼ inch or so apart, and as its name suggests, is used to build scaffolding, scenery, and other temporary structures. This type of nail is driven to the first head and the second nail is used later to pull it out. A drywall nail typically has a cupped head and a ringed shank. The most common lengths are 1 3/8 inch (3.74 cm) and 1 1/2 inches (3.8 cm). They are available in different gauges, which indicate the diameter of the shank. The most common one is the 13 gauge nail. The ringed shank helps the hold the nail in place after it is driven through the drywall and into the stud. Finishing nails are used when the nail head must be invisible to the eye. Finishing nails have small heads and smaller diameters than common nails. These type of nails have a barrel-shaped head with a small diameter and a dimple on top. Once the nail has been driven almost flush with the surface, the point of a nail set is placed in the dimple, and the head is driven below the surface. When driving a finish nail, stop when the nail head is about 1/8 inch above the surface. Then place a nail set into the finish nail's small indentation in the head and drive the nail under the surface. Masonry nails are usually manufactured in three different types: round, square, and fluted. Masonry nails should not be used where high strength is required. Fastening to brick, stone, or reinforced concrete should be made with screws or lag bolts. Tack nails are available in both round and cut forms. Tack nails are used to hold carpet or fabric to wood. Upholstery tacks have decorative heads.